Summary: This article will show you 2 different ways to delete backup on Android phone, such as Samsung, Huawei, LG, HTC, Sony, Motorola, ZTE, OPPO and etc. in almost all models. When an Android device has been rooted and backed up for several times, there would be more and more storage space on Android device while lots of photos, videos and app data are storing on your device. To be honest, as time goes on, there might be some Android back files become useless but they are taking up large amount of storage space on Android device. So how to delete backup on Android devices? Let's see how to make it together. There are several ways to back up Android data and one of them is using Google account. If you have backed up your Android files with Google, you can check the instructions to delete Android backup through Google account. Step 1. Sign into your Google account with your ID and password, then open the application launcher on your device. Step 2. 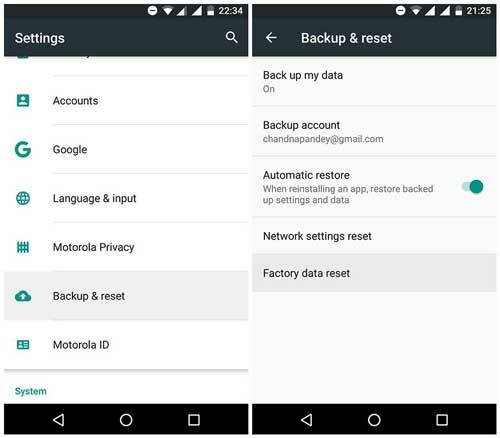 Then tap "Settings" > "Backup & Reset" on your Android phone, and disable the "Back up my data" and "Automatic restore" features. Step 3. Now, please tap "Back" option to go back to Settings page and tap "Personal Dictionary" and tap a word in it. Trash the trash icon on "Google Keyboard". And tap "Voice Search" option and uncheck the box beside "Personal Recognition" to remove your personal voice profile from Google server. Step 4. Go back to App launcher and tap "Play Store" and select "..." three-dot icon on the top right corner and tap "My Apps" option. Then you might tap "All Options" to check all backup files on your Android device and tap "X" sign next to the unwanted apps to delete them. Thus all the backup files on your Android phone will be removed immediately, and the space of your device will be freed up. To delete Android backup files, there is a better way to erase backup files on Android forever using Coolmuster Android Data Eraser (Windows/Mac) with one simple click. With it, you can permanently delete the unwanted backup files on Android with zero opportunity to recover, including personal files like photos, videos, contacts, messages, call history, voice memos, calendars, apps on Android device, also it can delete the junk files on Android device like app data, app caches, app cookies, app temp files, app crash logs, download temp files, photo caches, user storage files and etc. 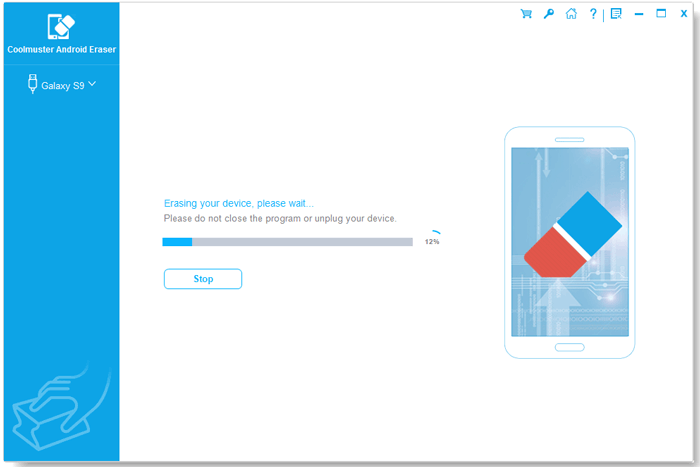 Below are the free trails of the Android Data Eraser in Windows and Mac version. Now, please download and install the right version on your computer and start to clear backup files on your Android phone and make your Android phone run faster than before. Step 1. 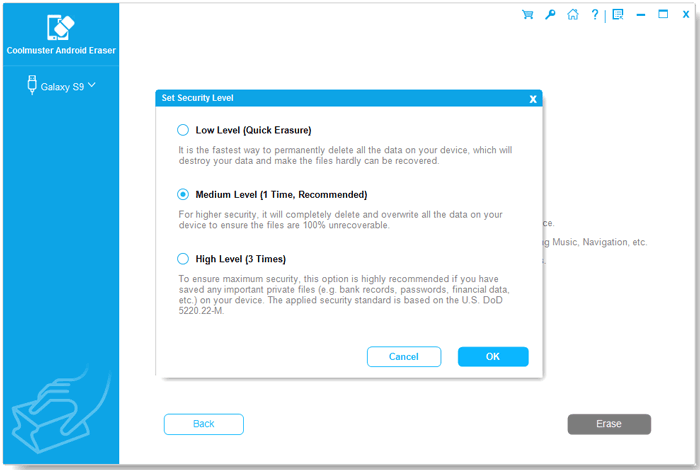 Download the right version of the program on your computer (Windows PC or Mac) and launch it, and connect your Android device to computer with a USB cable. Then enable USB debugging as prompted to detect your device. 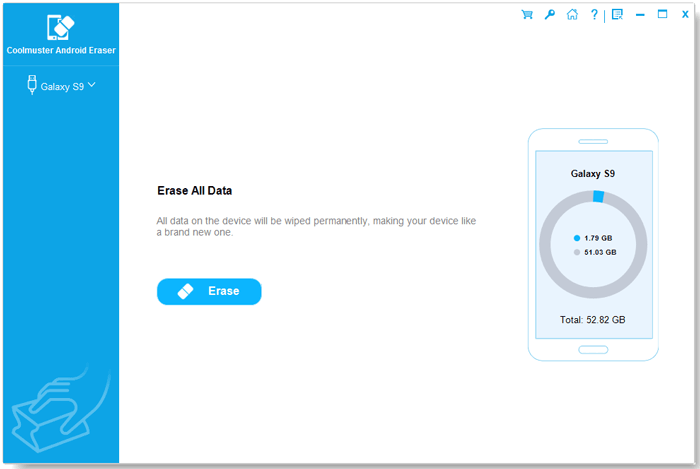 Tips: Currently, this program only support Erase All Data mode for Android device, so please remember to backup your Android phone before deleting data from your device in case of unexpected data lost. And it will be improved with more functions soon. Step 2. After detecting your device, please click "Erase" mode and choose erasing level you need. Step 3. Then the program will start erasing and overwriting all files from your Android phone, including the backup files on Android. Step 4. Finally, please restore your Android phone to factory settings to wipe out all system settings on your device. Thus all the Android backups will be deleted from your Android device. And then you can better enjoy your Android phone. 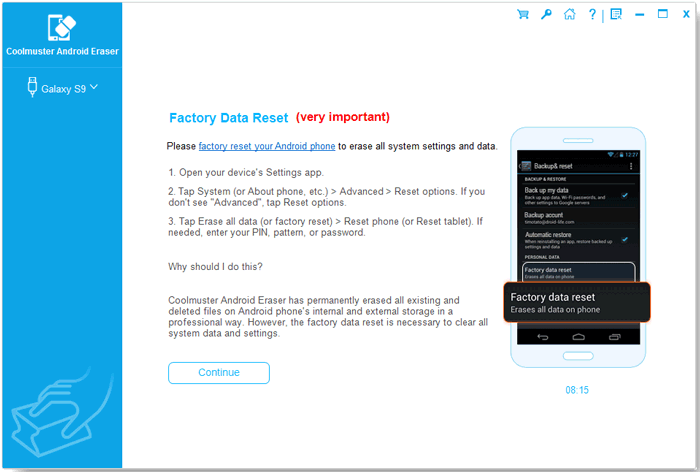 Why not have a try with the free trails of the powerful Android Data Eraser now? How to Delete Contacts on iOS 12/11 in Batch?